9PM - It's Anthony Marostica's Birthday! (Not really... it's just like any other day, but with cake! And champagne!) Going to dinner @ Manna, our new favorite birthday spot for some fun champagne falls. Should be highly entertaining to say the least. 11PM - Drinks @ Crazy Hook, a Pirate themed bar in K-Town. What more could you ask for? 12PM - OC County Fair!! A whole day full of amazing foods, sights & wonder. I absolutely love going to the fair & watching the pig races, seeing all of the amazing floral designs, playing with the puppies (although I don't know if they have puppy corner at the OC, or if it's just an LA dealio) wine tasting & eating massive amounts of grilled corn on the cob. + learning about agriculture in California never hurts. 8:30PM - Yet again going to try for the Cinespia Cemetery Screening. Although, knowing my luck, there's no way I make it. 10:30PM - It's Wiian's Birthday! Barney's Westwood, here we come! Last year I found an inflated pig, which provided much amusement & many scandalous photos the next morning... now I have to figure out a way to top it. Wish me luck! 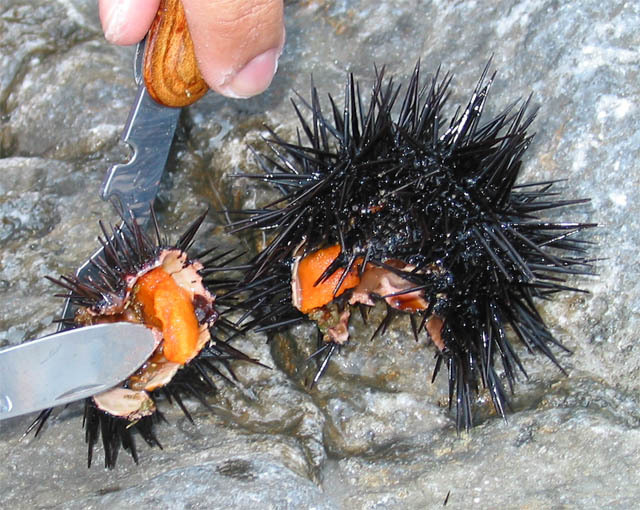 11AM - Live Fresh Sea Urchin @ The Hollywood Farmer's Market. 7PM - THE OTHER GUYS! I'm very much looking forward to an evening of hilarity with Will & Mark-y Mark.